ABC sorely needs a surefire hit, and The Rookie looks like the best bet to deliver as a cop drama with a sometimes unsteady aim in Tuesday’s premiere. The star of the show, Nathan Fillion, is cut in the mold of high-appeal TV guys such as Tom Selleck, Mark Harmon and David Boreanaz. Viewers respond to them without much if any coaxing. Knowing this, ABC has put more promotional muscle behind this show than for any of its other new fall series. If it somehow flops, the network will be licking some deep wounds. In a far-fetched stretch, the two of them then find themselves in the middle of a bank heist after Nolan has discarded his wedding ring in a safe deposit box. An armed masked robber smashes him in the face when Nolan starts spilling his guts about self-identity. Warned to stay down or be killed, Nolan instead rises again to ask, “What’s my dream?” Luckily for him, the cops bust in just before the bad guy can plug him. Nolan is among three featured freshman cops paired with veteran no-nonsense partners. Rookie Lucy Chen (Melissa O’Neil) gets the worst of it, a belittling Mark Fuhrman type with a seeming racist streak named Tim Bradford (Eric Winter). Jackson West (Titus Makin), whose dad is a powerful string-puller, rides shotgun with Angela Lopez (Alyssa Diaz) while Nolan is teamed with savvy Talia Bishop (Afton Williamson). The first day is action-packed, of course. Nolan and Bishop first respond to a domestic violence call that later on has a bit of a twist. Nolan also huffs and puffs after a deranged man who’s first seen pounding a car windshield senseless with a baseball bat. The three rookies later wind down at a bar where their waitress instantly has eyes for Nolan. But he turns out to be already taken, which provides another twist, albeit a not terribly effective one. The following morning’s roll call finds the watch commander again ridiculing Nolan before all three of the new cop duos are pinned down by a parole violator spraying fire from an automatic weapon. Justice prevails, though, before Nolan gets ridden hard again by the officious watch commander. 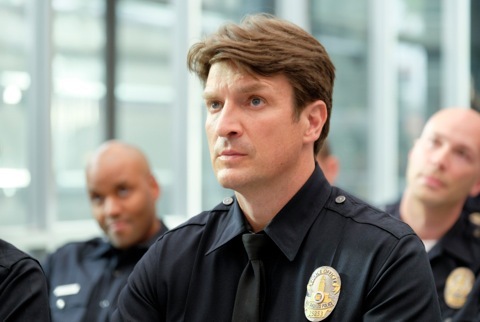 The Rookie’s action scenes are capably staged in a pilot episode that’s also brisk and well cast beyond the built-in marquee appeal of Fillion. But the lead character’s back story is barely touched on. And Nolan’s training to become a cop is completely omitted in the rush to get him out on the streets and imperiled. Amid all this fast-forwarding, Fillion does not have to be force-fed. Enough viewers probably know and like him enough to make The Rookie instantly click in the ratings. Only the first episode was made available for review. Future hours would benefit from being a bit slower on the draw.